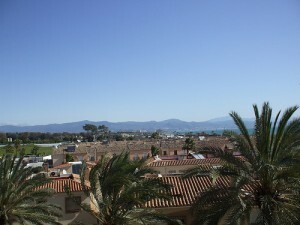 Marbella. Playground of the rich and famous, and undoubtedly Spain’s number one destination for sailing vacations and luxury yacht charters. Situated on the country’s south coast, the resort enjoys a dramatic location on the Costa del Sol, in between Gibraltar and Malaga. Behind it’s white washed old buildings and swanky seafront hotels the Sierra Blanca mountains rise majestically towards azure skies, whilst in front the cobalt blue planes of the Mediterranean shimmer under the Spanish sun as they reach out to North Africa. Impressive marinas, such as the legendary Puerto Banus, line the coast to the east and west of the resort and the white gleam of catamarans, power boats and sailing yachts bobbing in their harbours is visible nearly everywhere you go. Even more impressive are mega yachts of celebrities, business tycoons and royalty dropping by for summer, along with the vast luxury cruise ships calling into port. Marbella first rose to prominence as a tourist destination for the good and the great as far back as the 1950s when word got out about the wild beauty of this, at the time, sleepy Andalusian town, with it’s 27km of sandy coast and beautiful old quarter, full of picturesque plazas, orange trees and mixed remnants from its Roman, medieval and Moorish past. Soon the likes of the Duke and Duchess of Windsor, the Rothschilds, the Saudi emirs and the first wave of Hollywood stars started to flock to the Costa del Sol. And, whilst these days the town is a much more accessible destination for all budgets, with a range of hotels and apartments to suit, Marbella has never lost it’s star quality. 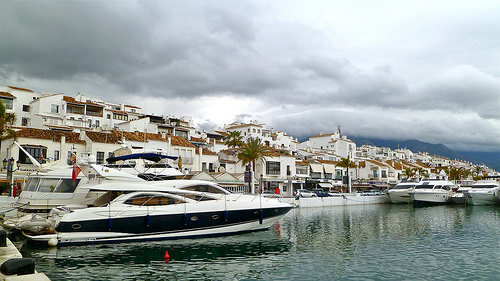 You’ll still find plenty of celebrities sailing into town on their super-sized yachts, and the whole of this region of Spain is packed with 5-star resorts, such as the Sotogrande with it’s famous Valderrama golf course; whilst of course Puerto Banus, just 15km from Marbella, is still a byword for luxury. A marina and shopping complex in one, the port is a haven of retail therapy, fine dining and nightlife and visited by a staggering 5 million tourists every year. What’s more in 2011, Sheik Abdullah Ben Nasser Al-Thani (the mega rich owner of Malaga Football Club) obtained permission to start a 350 million euro revamp of Marbella’s very own La Bajadilla marina. The port will be renamed Puerto Al-Thani, and as well as a new shopping centre and 5-star hotel the marina will increase in capacity to host up to 1220 boats… so far from being a fading glory, it looks like Marbella may be the Mediterranean’s number one sailing hot spot for years to come! 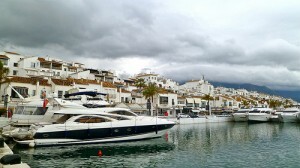 So, apart from bathing in the celebrity star dust, what is there to do on a sailing holiday in Marbella? 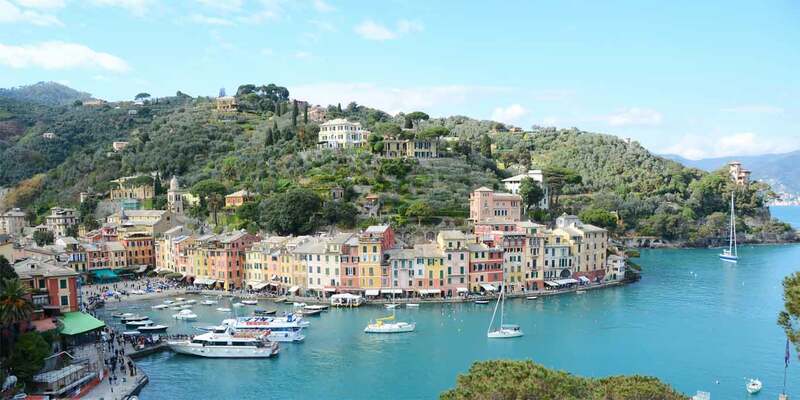 Once you’ve found a place to hire your luxury boat or charter a yacht (most companies will offer you a choice of bareboat or skippered), you’ll be spoiled for choice for places to head under sail or steam. You could start by heading East to Malaga, the largest city on the Costa del Sol and a highlight of any trip to Spain thanks to its Moorish castle, Roman amphitheatre and lively nightlife. And why not stop off at Torremolinos, one of the coast’s most popular holiday resorts en route. Head West instead and you could sail to Gibraltar, a British enclave on the very edge of Spain where you can enjoy tax-free shopping and of course admire the amazing Rock of Gibraltar, home to 250 Macaque monkeys. The Straits of Gibraltar, the stretch of sea that separates the Mediterranean from the Atlantic are a legendary shipping point and you can often go dolphin watching or go fishing for red or yellow fin tuna and marlin. Finally, since you’re so close why not take your sailing vacation in two continents and head over to Africa. Many boat charters leaving from Marbella visit the Moroccan port towns of Tangiers, Tetuan or Smir. Being such a great nautical destination, naturally Marbella also has a number of schools offering sailing courses. For related topics, read on for more information on sailing in the Costa del Sol, or head to our overall guide to sailing holidays in Spain for a look at all of the country’s best destinations. Try typing “Costa del Sol” into the destinations field of our search engine above. If you don’t find what you’re looking for then send us your request via our enquiry form instead as we have many boats not listed in our search engine.